One of my favorite weeks in Jacksonville is coming up: THE PLAYERS. I love the social aspect of this event, running into old friends and walking around to all the different areas is fun. I do make time for the golf too, I like to watch the rush of people following the leaders and celebrities and I enjoy watching the golfer’s attempts at 17. This year they have added new venues and healthy food options. I was recently invited to participate in a tasting at TPC Sawgrass. They wanted to share some of their new menu items for THE PLAYERS coming up May 6-12th. Included in these offerings are gluten-free and vegan sandwiches and other food. They are trying to go beyond hot dogs and hamburgers by incorporating fresher foods and healthier options. THE PLAYERS has really tried to capitalize on the social aspect of the tournament as well as improving the fan experience. In addition, they have heard a lot of feedback that people want more options and healthier food. Upon arrival to The Patio, they offered us wine and beer. I was so excited to see that among the options was Omission gluten-free beer THE BEST gluten-free beer I have tried. During THE PLAYERS you can get Omission gluten-free beer at the PGA Tour Café. Prom Catering, the caterer for the PGA Tour, led the night by explaining some of the new dishes and their signature dish, Shrimp and Grits with a fried green tomato (not gluten-free). The first item I tried was the Avocado Power Lunch on gluten-free bread. 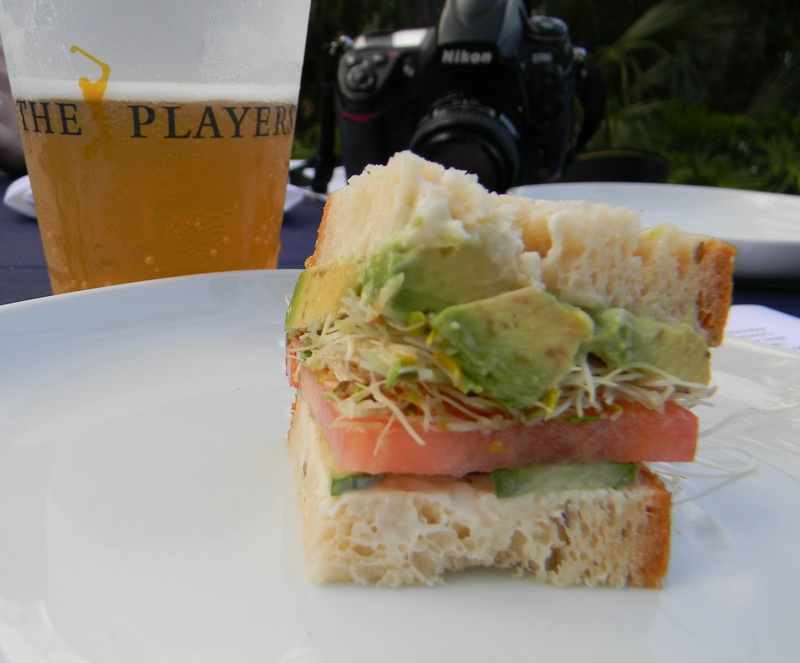 This sandwich Included avocado, tomato, sprouts, cucumber slices and a lemon aioli. This can be found at The PGA Tour Café. I really loved this. Not sure if this would fill me up at the tournament because there is no protein, however, I loved the flavors, the lemon aioli with sprouts and avocado was tasty. Next up was the Chick’n salad sandwich on gluten-free bread. This can be found at the The PGA Tour Café. I really liked this. 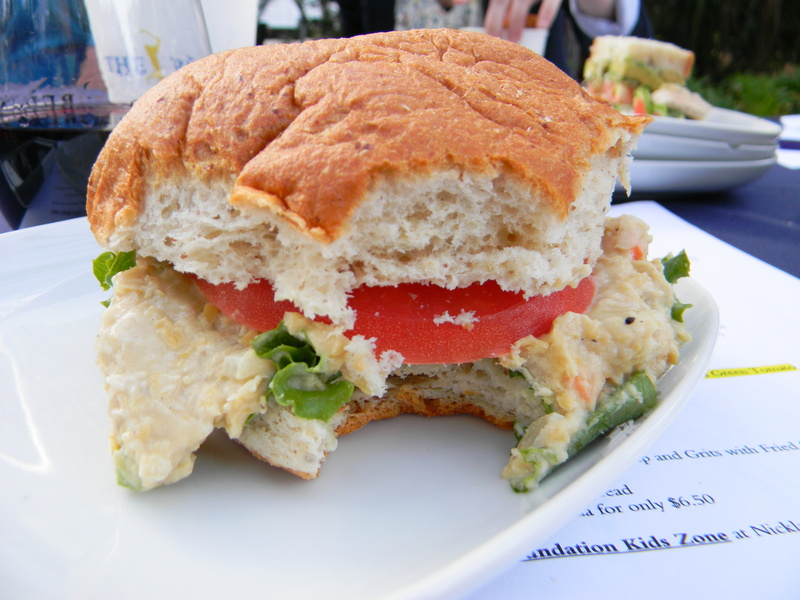 It is a vegan play on the chicken salad sandwich, made with chick peas instead of chicken. This was a little more filling than the Avocado Power Lunch. Lastly, I tried the Bubba turkey burger on a gluten-free bun. 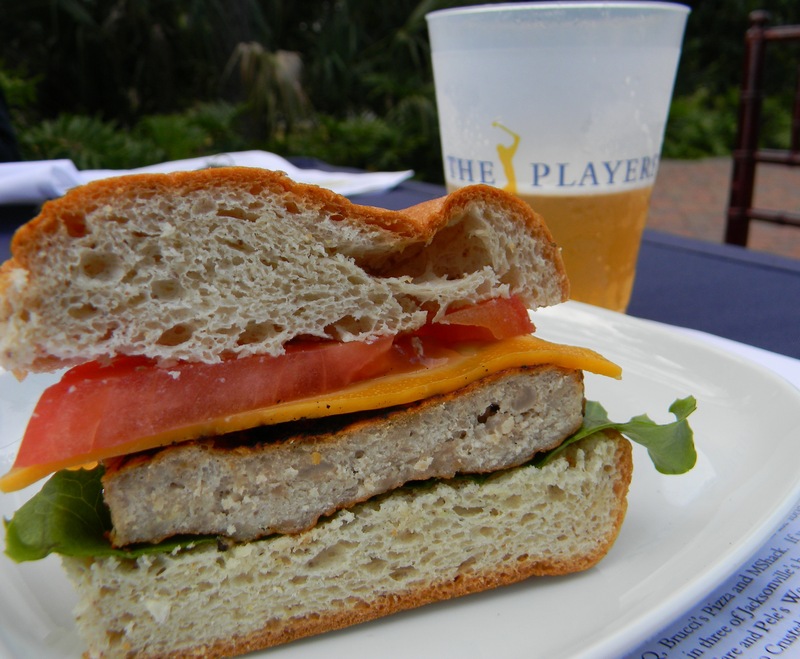 This is served at the PGA Tour Café. I probably would have added some mustard or mayo to this but it was hearty and healthy and a great alternative to a regular burger. – Enjoy Medure’s gourmet small plates in a beautiful garden setting also features the BERINGER® Wine Bar for a fine selection of reds, whites and rosés. Located left of 9 Fairway, there are also permanent restrooms next to Wine & Dine on 9. – Youth 18 and younger are admitted free of charge when accompanied by a ticketed adult – there is no limit. However, that policy does not apply to the tournament’s hospitality venues (The Benefactor, The Turn), where children ages 6 and older will need an upgraded ticket to gain admittance. – The McKenzie Noelle Wilson Foundation Kid Zone, features a “GameTruck,” a putt-putt course, arts and crafts and more. – THE PLAYERS will provide all active duty, Reserve, military retirees and dependents with complimentary admission to the tournament all week. – Club 1791, named for the year in which Jacksonville was founded, offers fans a place to relax on comfortable seating, cool off while watching the broadcast on large, flat-screen TVs, and stay connected with cell phone charging stations and WiFi hot spots. – The Oasis – Located beteen 9 and 18 tee boxes, features the air-conditioned NOLET’S® Silver Lounge (for guests 21 and over), where signature cocktails, including THE PLAYERS Punch made with NOLET’S Silver, are available for purchase. This public venue also has food and drink for purchase. Features a rear deck for prime views of No. 9 tee. – The Patio – adjacent to 16 tee and 18 green offers a larger shaded fan zone that includes open-air seating, a video board to keep up with the tournament and food and beverage available for purchase. The Patio features permanent restroom facilities. – Food Court – Located behind No. 16 green – near The Grove – there are plenty of great, local restaurants to choose from in The Food Court. And there’s shaded seating close by at The Grove, so everyone can grab a bite to eat and meet up for a family picnic at THE PLAYERS. Restaurants featured in the Food Court include: PGA TOUR Café, Bono’s Pit Bar-B-Q, Brucci’s Pizza, Firehouse Subs, MShack, and Tropical Smoothie Café. – “Four for Free” Parking: Fans with four or more guests in a vehicle can park for free Thursday through Sunday with the “Four for Free” parking voucher. Fans can go online to http://www.PGATOUR.COM/theplayers to download the voucher, which allows free parking in the general lot off of CR210. Do you enjoy going to THE PLAYERS? What is your favorite part? Is this in a different format? Or is it because it’s on my phone?? Thanks for the timely info! I will definitely be using this when I get to TPC. Printing now!